All types of exercise burn calories, but different settings on your treadmill serve the needs of different goals. The "fat burn" setting is less intense than the "cardio" setting, and may actually help you get rid of fat more efficiently. According to the journal "Nutrition," fat-burning rates are highest when you exercise at moderate intensity — about 50 percent of your maximum heart rate. The main difference between the fat burn and cardio settings on a treadmill is the heart rate zone. Whenever you do physical activity, your heart rate increases above your resting rate. The American Heart Association recommend exercising at 50 to 85 percent of your maximum heart rate. The maximum depends on your age; you calculate it by subtracting your age from 220. For a 35-year-old, for example, the target heart rate zone is 93 to 157 beats per minute. The cardio setting will put you in the higher end of that range, while the fat burn setting is in the lower end. As you increase your heart rate, exercise gets more intense. Higher-intensity exercise burns more calories per hour than lower-intensity exercise. However, you may find it easier to exercise for a longer period of time in the fat-burning zone than in the cardio zone, leading to a higher overall calorie burn. Although you may burn more calories in a shorter amount of time during a cardiovascular workout, the level of fat oxidation in your cells actually decreases as your heart rate increases. Lipolysis, or the dissolution of fatty acids in your cells, is highest during moderate activity and does not actually increase as you progress to vigorous activity; in fact, according to research published in 1998 in the journal "The Physician and Sportsmedicine," fat oxidation falls slightly once you reach 85 percent of your maximum oxygen capacity. High-intensity cardiovascular exercise will help your body become more efficient at burning calories and fat over time; in essence, it's good for your body to experience the light stress placed on the muscles and organs during a high-intensity workout. 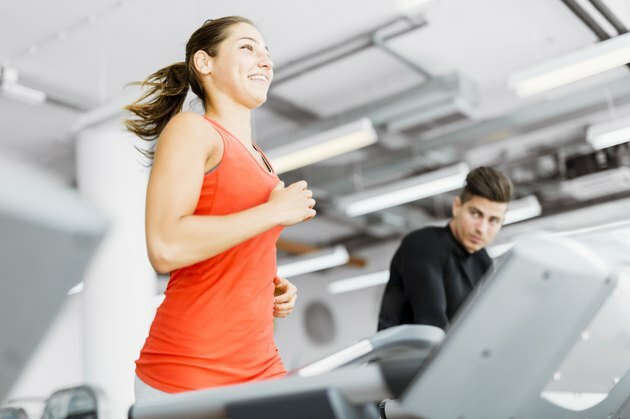 However, if you're exercising mainly to burn fat and lose weight, using the fat-burn setting on the treadmill may be more helpful in the short term. Throwing in a high-impact workout once a week or so, though, is good for your heart and will improve your performance in the long term. Discuss your exercise regimen and weight-loss goals with your doctor. Does Lifting Weights Burn More Calories Than Cardio? How Many Calories Are Burned on a Stepper? How Long Do I Have to Do Cardio to Burn 600 Calories?